Join us in Glasgow for the latest in our programme of events across the country! We’ll be discussing open government and the current work the Scottish Government is doing with the public and civil society. This is your chance to help shape the future direction of openness, transparency and participation. The Scottish Government and Open Government Network are inviting you to have your say on the themes and issues that can help make government in Scotland more open, transparent and accountable. So whether you would like to see more data released in areas such as transport or agriculture; you’d like to be involved in developing new public services; or want more information on how public money is spent, come along and let us know. Are there ways in which we’re sharing more information with the public? Where can we be doing more? Find out more about open government and the Partnership, meet the team and discuss your views and ideas about how we can make government work better for Scotland. 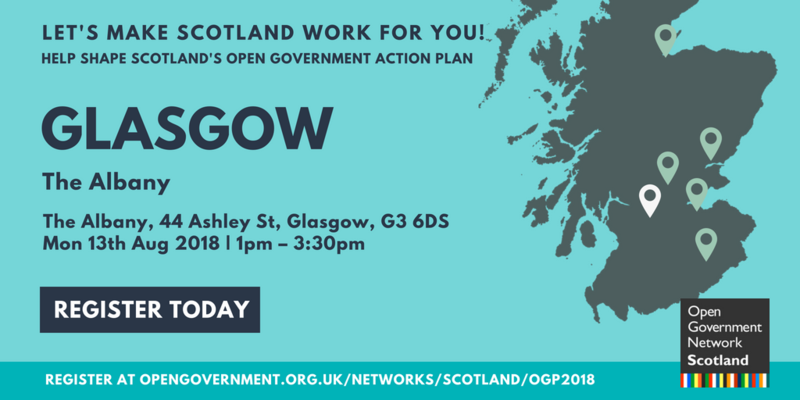 This free informal workshop style event is hosted by the open government team at the Scottish Government, and we’ll be joined by the civil society open government network too. Governments use public money to shape the society we live in. The decisions they take impact on the day to day quality of life that we enjoy. Open governments do not just allow us to see what decisions are made, they allow us to take part in shaping them and provide us with the information we need to examine and challenge their choices. The Scottish Government is part of the Open Government Partnership: an international programme to rebuild trust in governments across the world by providing a platform for reformers inside and outside governments. As we develop the new action plan (for 2018-20) we are working closely with the Civil Society network to invite the public to share their ideas to support our ambitions for openness and participation. This event is open to everyone! All welcome, whether you’re an interested member of the public, working professionals or a student. You don’t need to know anything about open government, we just want to hear what you think. We encourage everyone to take part and share their ideas, but feel free to say as little or as much as you like. What is open government? – speakers from the Scottish Government open government team, and the civil society open government network. 2:00pm – Workshop discussions – what changes do you want to see? Small group discussions – everyone is welcome to take part as little or as much as they want.